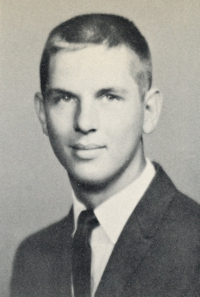 Obituary – Snodgrass, Jack Lee « Perry High School Alumni Association, Inc.
﻿Football ’61-’62; Basketball ’61-’62; Track ’60-’62; Homeroom Vice-President ’60-’61; English Assembly ’60-’61; Homeroom President ’59-’61. ﻿S-Sgt. Jack Lee Snodgrass of Perry, a career Marine, was killed in action last Thursday in Vietnam, his parents were notified Tuesday night by the Defense department. Snodgrass was the son of Mrs. Howard (Myrtle Lucille) Kistler, 809 Fourteenth street, and step-son of her husband. He was a 1962 graduate of Perry high school. He was mortally wounded by shell fragmentation while under enemy fire near Quang Tri, south of the demilitarized zone in Vietnam, the Defense department telegram said. No other details were furnished immediately. 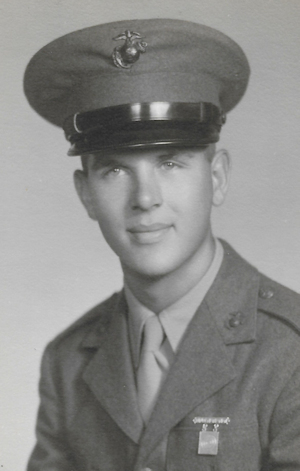 Snodgrass joined the Marine Corps in 1962, shortly after graduation from Perry high school. He was stationed at San Diego, Calif., and in Hawaii before going to Vietnam five months ago. He was born March 22, 1943, in Wichita, and came to Perry in 1959 with his family. He was a member of the PHS football, basketball and track squads. He was married in April 1967 to the former Marla Layton, in San Diego. A daughter, Lisa, was born after he arrived in Vietnam. His wife and daughter live in San Diego. In addition to his wife, daughter, mother and step-father, survivors include his father, Boyd Snodgrass, Dallas; two sisters, Mrs. Connie Hawthorn, Stillwater; and Cindy Kistler, Perry; a brother, Gary Kistler, Wichita; maternal grandparents, Mr. and Mrs. H. A. Gilmore, Perry; and paternal grandparents, Mr. and Mr’s. Charlie Snodgrass, Drummond. The body will be returned to Perry for services, to be announced by Parker funeral home. Snodgrass is the third Noble county serviceman killed in Vietnam. Pfc. Ernest Vetter of Red Rock died there as a result of enemy action in April, and Kenneth Russell of Perry was killed in combat last year.